The brain contains several well-defined dopaminergic systems. The most extensively studied are the nigrostriatal, mesolimbic, and mesocortical neuronal systems that originate in the midbrain and project to the striatum, limbic system, and cortex, respectively. These are involved in the control of locomotion, emotion, and cognition and have no direct role in the regulation of pituitary function. 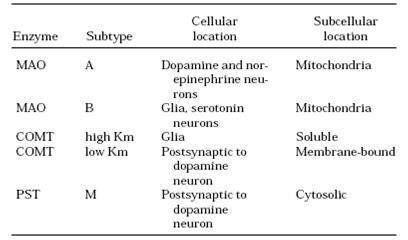 Within the hypothalamus, dopamine perikarya are located in several sites that are classified by the alphanumeric system of Dahlstrom and Fuxe . Neurons originating from arcuate nucleus (A12) and periventricular nucleus (A14), are relevant because they are directly involved in the control of Prolactin (PRL) secretion. Based on anatomical and functional studies, two dopaminergic systems that regulate PRL were initially identified: the tuberoinfundibular dopaminergic (TIDA) and tuberohypophysial dopaminergic (THDA). DOPAMINE belong to a class of neurotransmitters known as catecholamines, which are structurally defined by a catechol ring and an amine side chain. Catecholamines are referred to as monoamines. Monoamines are small, water-soluble molecules that are the decarboxylated derivatives of amino acids. Production from their respective amino acids is catalyzed by several enzymes that act in sequence, the first of which serves as the ratelimiting step. Dysfunction of dopaminergic systems is associated with a number of diseases. For example, deficiency of dopamine in midbrain nigrostriatal neurons has long been recognized in the pathogenesis of Parkinson’s disease . Within the brain, catecholamines function as classical neurotransmitters, i.e., they communicate between neurons and act within the anatomically confined space of the synapse. 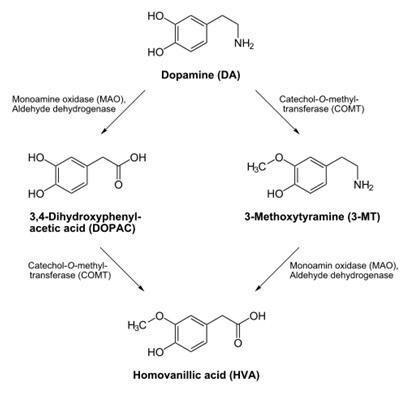 Dopamine is synthesized from the amino acid tyrosine; the majority of circulating tyrosine originates from dietary sources, but small amounts are derived from hydroxylation of phenylalanine by the liver enzyme phenylalanine hydroxylase . Blood-borne tyrosine is taken up into the brain by a low-affinity amino acid transport system and subsequently from brain extracellular fluid into dopaminergic neurons by high- and low-affinity amino acid transporters. TH is the rate-limiting step in their biosynthetic pathway; the TH gene is localized to chromosome 11p in humans and encodes a single form of TH that can be alternatively spliced. The mRNA expression of the TH is abundant throughout the human mesencephalon. The mature enzyme is a soluble cytosolic protein composed of four subunits of approximately 60 kDa each. So for L-dopa formation, L-tyrosine, THFA (tetrahydrofolic acid), and ferrous iron are essential and for dopamine biosynthesis from L-dopa, pyridoxal phosphate is essential. The activity of the enzyme rises and falls according to how much pyridoxal phosphate there is. 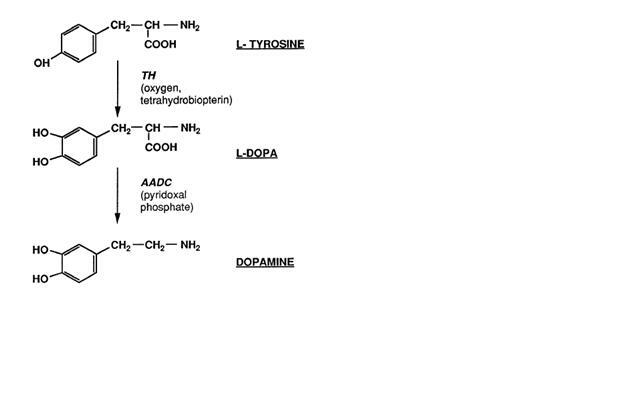 Besides two enzymes being required for the formation of dopamine from L-tyrosine (L-tyrosine >>> L-dopa >>> dopamine), three coenzymes are also required. They are : THFA (for L-tyrosine to L-dopa), pyridoxal phosphate (for L-dopa to dopamine), and NADH (for the formation of THFA and Pyridoxal phosphate). The cofactor tetrahydrobiopterin (BH4) donates the hydrogen atom needed for hydroxylation of tyrosine to DOPA. In dopaminergic neurons, the neurotransmitter is transported from the cytoplasm to specialized storage vesicles at extremely high concentrations, 0.5–0.6 m, which is near its limit of solubility. 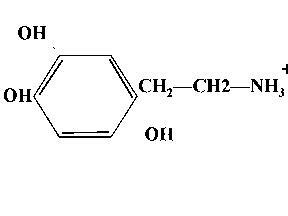 Here the amine is concentrated to approximately at a 100- to 1000-times higher than the level in the cytosol. Storage vesicles are formed in the neuronal perikarya and are transported to the terminals by slow axoplasmic flow. 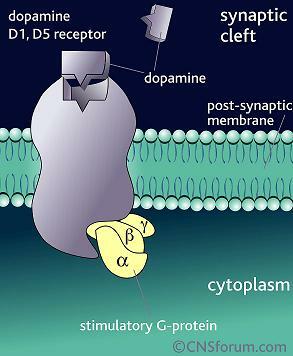 Dopamine is translocated from the cytoplasm into the vesicles by the vesicular monoamine transporter (VMAT). to enable rapid replenishment of depleted stores. Monoamines are stored primarily in small translucent (“clear”) vesicles (50–100 nm in diameter) but are also present in large dense core vesicles (up to 500 nm in diameter), often cosequestered with neuropeptides. The synaptic vesicle is a highly specialized structure whose membrane is composed of a lipid bilayer with embedded integral proteins that participate in vesicular trafficking, docking, and fusion. The vesicle membrane also contains an H+-ATPase, which maintains the proton gradient that energizes VMAT and preserves an acidic intravesicular environment. Each vesicle is filled with several thousand molecules of dopamine as well as other soluble constituents . Upon the arrival of an action potential, a change in membrane protein conformation allows the influx of calcium ions, which is a key part of the stimulus responsible for the fusion of vesicles with the neuronal membrane. By the process of exocytosis, vesicles discharge their soluble contents into the synapse . The docking mechanism involves a family of proteins termed _ soluble N-ethylmaleimide- sensitive factor (NSF) attachment proteins (_SNAP) receptors (SNARE) complexes: v-SNAREs, designating vesicular-associated proteins, and t-SNAREs, designating target (plasma membrane) cognate complexes. Calcium is central to all aspects of exocytosis, including rapid fusion and unloading of the vesicles as well as recruitment and translocation of loaded vesicles. Calcium influx occurs through voltage-gated calcium channels and leads to fusion of the synaptic vesicles with the plasma membrane and release of their content to the extracellular space. This is a much faster process than the relatively slow release of peptide or protein hormones from endocrine cells. 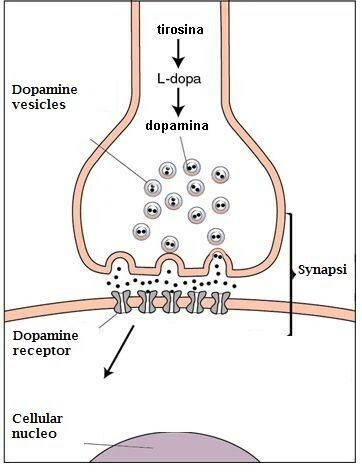 In most neurons, dopamine is released into the synaptic cleft and binds to postsynaptic receptors. In contrast, the dopaminergic neurons of the hypothalamo-pituitary unit (with the exception of the dopaminergic neurons innervating the intermediate lobe of the pituitary) lack true synaptic contacts and are classified as secretory neurons . In this case, dopamine diffuses away from the terminals through the perivascular space and is transported by portal blood to distal pituitary target cells. The rate of dopamine release from secretory neurons appears to be slower than that from classical neurons. It is assumed that only a small fraction of docked vesicles can instantaneously release their cargo in response to calcium influx. These vesicles comprise the “fusion-ready” pool that undergoes a very rapid ATP-dependent fusion. The slower release phase is carried out by docked vesicles that exist in a different biochemical state and require priming to promote fusion. These vesicles constitute a precursor pool that replenishes the rapid release pool. Priming is ATP dependent, involves the SNARE proteins, and is associated with production of phosphoinositides and protein phosphorylation. An even slower pool is composed of vesicles that are anchored to the cytoskeleton via actin-binding synapsins but are not docked to the membrane . Reuptake is the process by which the released transmitter is brought back into presynaptic nerve terminals or is internalized by surrounding glial cells. dopamine transporter DAT, which transports dopamine from the extracellular to the intracellular space, and VMAT, which reloads dopamine into the vesicles. This is an energy dependent process. 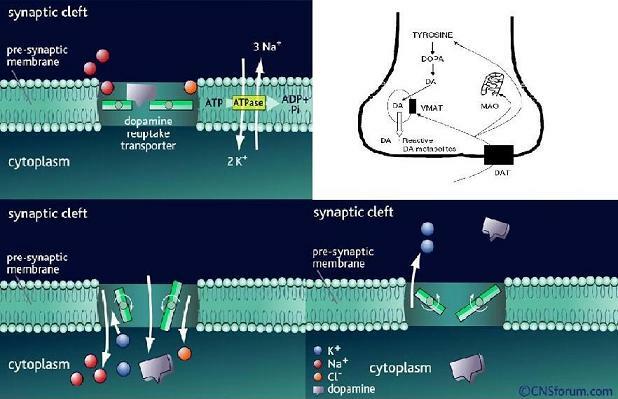 Sodium/potassium ATPases use energy from ATP hydrolysis to create a concentration gradient of ions across the pre-synaptic membrane that drives the opening of the transporter and co-transport of sodium and chloride ions and dopamine from the synaptic cleft. Potassium ions binding to the transporter enable it to return to the outward position. Release of the potassium ions into the synaptic cleft equilibrates the ionic gradient across the pre-synaptic membrane. 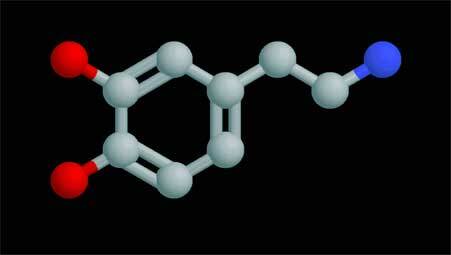 The dopamine re-uptake transporter is then available to bind another dopamine molecule for re-uptake. The main enzymes responsible for the metabolism of dopamine are shown in the figure above. Catabolism is one of the effective mechanisms for dopamine inactivation. of the mitochondria and acts intracellularly, whereas COMTis associated with the external cell membrane and acts only extracellularly. Exists as two isoenzymes, A and B, with an apparent molecular mass of 60–63 kDa each. The two MAO genes,each comprised of 15 exons, are located on the X-chromosome and appear to have been derived from the same ancestral gene. They differ in substrate specificity as well as selectivity for inhibitors. whereas MAO-B is more abundant in serotonergic and histaminergic neurons and in glial cells. Deamination of dopamine by MAO produces dihydroxyphenylacetic acid (DOPAC). Determination of the ratio of DOPAC/dopamine concentrations serves as a good method for estimating rapid changes in neuronal activity. O-Methylation by COMT is primarily responsible for inactivation of circulating catecholamines. Consecutive conversion of dopamine by MAO and COMT yields homovanillic acid. The enzyme introduces a methyl group to the catecholamine, which is donated by S-adenosyl methionine (SAM). COMT is an intracellular enzyme located in the postsynaptic neuron. Any compound having a catechol structure, like catecholestrogens and catechol-containing flavonoids, are substrates of COMT. The D1-like receptor family contains the D1 and D5 receptor subtypes and the D2-like family contains the D3 and D4 subtypes. The D1-like receptors are found throughout the brain and in blood vessels and smooth muscle. Dopamine D1-like receptors are coupled to stimulatory G-proteins and they have a stimulatory effect on neurotransmission when bound by an agonist. Regions of the brain with a high density of D1-like receptors tend have a low density of D2-like receptors whereas regions of the brain with a low D1-like receptor density have a high density of D2-like receptors. The D2-like family contains the D2, D3 and D4 subtypes and the D1-like receptor family contains the D1 and D5 receptor subtypes. The D2-like receptors are found throughout the brain and in smooth muscle and presynaptic nerve terminals. Coupled to inhibitory G-proteins, dopamine D2-like receptors have an inhibitory effect on neurotransmission when bound by an agonist. 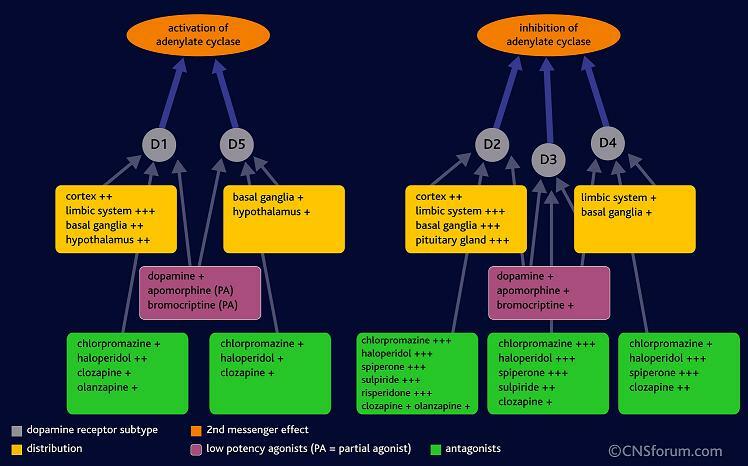 Many neuroleptic drugs are antagonists of the D2 receptors. 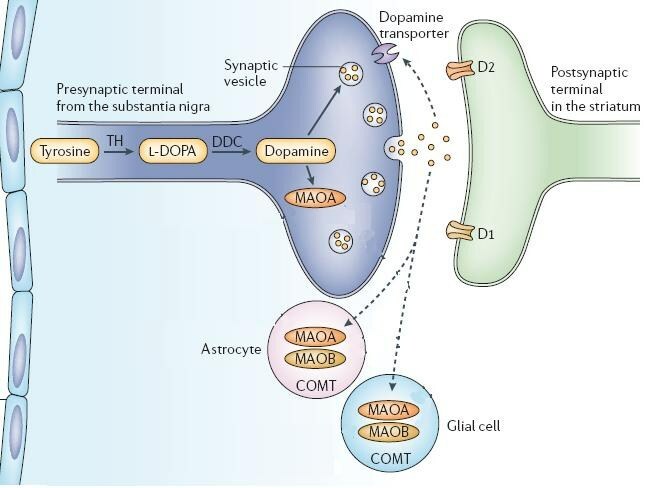 Dopamine agonists play an important role in the regulation of the central nervous-cardiovascular, renal, and hormonal systems through stimulation of dopaminergic (DA1 and DA2) and alpha- and beta-adrenergic receptors. Several studies have shown that in fat and diabetic mice. The aim of the present study was to evaluate the interaction of the dopaminergic and endocrine systems by determining the effect of the dopaminergic antagonist, metoclopramide, and dopamine on insulin secretion and cardiovascular response by blockade and activation of dopamine receptors in healthy and type 2 diabetic subjects. Healthy subjects (n =15) and subjects with type 2 diabetes (n = 15) of both genders, aged 18 to 60 years, were recruited into this study. A comparative experimental design of 90 minutes was performed in which placebo (0.9% saline) was infused intravenously for the first 30 minutes followed by metoclopramide (7.5 microg/kg/min), a dopamine receptor antagonist for 30 minutes, and then metoclopramide (7.5 microg/kg/min) plus dopamine (0.5-3 microg/kg/min) for 30 minutes. The following clinical and biochemical parameters were measured at the beginning and then every 30 minutes of the experimental period (30', 60' and 90'): systolic-diastolic and mean arterial blood pressure, heart rate, serum glucose, insulin, triacylglycerides, and total cholesterol. Baseline glycosylated hemoglobin was measured and homeostasis model assessment for insulin resistance was calculated from insulin and glucose levels. Twelve-lead electrocardiograms were also obtained at these points. Dopamine infusion induced an increase in serum insulin, systolic blood pressure, and heart rate in healthy subjects but not in subjects with type 2 diabetes. Infusion of metoclopramide induced a hypotensive effect in healthy subjects, which was blunted by inclusion of dopamine in the infusion mixture. In subjects with diabetes, metoclopramide had no effect on blood pressure, but addition of dopamine raised systolic blood pressure. Neither metoclopramide nor dopamine altered significantly the lipid profile in healthy or diabetic subjects. Dopaminergic drugs increase serum insulin probably by interacting with dopaminergic receptors, but stimulation of beta-adrenergic receptors cannot be ruled out. Stimulation of cardiovascular dopamine receptors also caused modifications of hemodynamic parameters in healthy subjects, but apparently these receptors are attenuated in patients with type 2 diabetes probably as a result of endothelial dysfunction and alterations in the sympathetic nervous system sensitivity. What happens when I do sport?